Your dad is an inspiration. 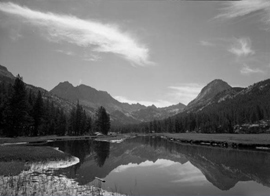 I love the shot of McClure Meadow. We are getting more involved in using our photography for educational and conservation purposes, while still trying to maintain fine art aesthetics. I have never felt more excited about our work. I agree with Mr. Hyde that you don’t have to travel far – photographing an area you are intimate with is so rewarding. Thank you, Sharon for reading. It is great that you are inspired by Dad and that you are doing more conservation work. In my experience, knowing that a creation is doing some good adds to the depth of feeling about making it. For a college student now, could outdoor photography professionals add more current practical information to this article. Photojournalism students are experiencing fewer internship oportunities and less summer job positions available in the field. Could you comment on career stability, benefit packages, thoughts on how to best prepare oneself with college course strategies or even general overviews? Experiential perspective from those who work in outdoor photography is what I am requesting. All serious feedback would be appreciated. Hi Julia, thank you for reading and for adding your comment. I am glad to hear from a college student such as yourself. I am not sure I can address what you are asking but maybe I can send you in the right direction. As is stated at the beginning of the first post (Part 1) in this series (this post is Part 2), this is an interview of Philip Hyde by Gary Braasch for the original Backpacker Magazine. It is presented here verbatim for its historical interest and significance. To find practical information on what it is like working in the field today, I would suggest you look to those who are doing so. I will feature some of them on this blog in profiles and interviews, or you can seek them out. In particular Jack Dykinga, Pulitzer Prize winning photo-journalist-turned landscape photographer, might be the place to start as he credits this Backpacker Magazine Article article with inspiring him to leave Chicago and start his career in the West in nature photography. It has been four years since Philip Hyde passed on, ten years since he lost his eyesight and worked actively in photography. I am a writer and a photographer on the side. I am the ambassador of my father’s photography. While Dad was way ahead of his time and photographed into the new Millenium, it would be unfair and misleading to readers to give them practical tips on working in photography today. My job, as I see it, is to inspire new photographers such as yourself to overcome your own set of challenges, by sharing how certain photographers such as Dad and his colleagues managed to meet the challenges of their day and triumph. The practical nuts and bolts are best obtained at a more basic level of a photo workshop or website geared toward technical concerns and business operations. Getting into the field is completely different now than it was in Dad’s day. How he started out is related for historical educational purposes, not for emulation, except on an attitudinal level. Though I am interested in inspiring people, I am also interested in warning them as well. A friend of mine recently asked me to participate in a career fair to tell high school students what it is like to work in photography. Some of them were taking photography and excited about it. I told her that I might be doing them a disservice to tell them how to get into the field. I might even say to those considering photography as a career, honestly, “DON’T.” It is becoming less and less viable all the time, particularly landscape photography. See the blog post “Photography’s Golden Era 2” for more on this. If you do nothing but fashion and commercial work, you might have a chance but those fields are even more glutted and competitive. I told my friend putting on the career fair that those who are doing it don’t have time to come to her fair and those who have time to come are probably not the ones doing it. She made some phone calls and found out I was right. So the serious feedback you request is: You will work and work and work and make very little income for your time invested. You have to love photography so much that you would do it for free. Then you might be at the beginning of considering it as an option, but even then, your odds of getting seen in the crowds are very slim. On this blog I am sharing with the world how charming, quaint and enjoyable photography used to be, but even then it was much more work than anyone can possibly dream that has not tried it. There was no market then and Dad had to establish it. Today, it is much easier to become a surgeon or rocket scientist, if you have the right mind for those, than to become a successful photographer. If you are attending a top notch school, that will make a big difference and probably help you get started. I hope this gives you the proper warning and if you are still interested regardless of how many people warn against it, you may have what it takes to make it and you will find the “how” as long as your “why” is bigger.